Pranab Mukherjee	"The soul of India resides in Pluralism and Tolerance"
‘Old Lady’ stuck in mud-pool, dies! KAZIRANGA : They tried their best to save the ‘old lady’, but even an excavator couldn’t budge her from the muddy pool. 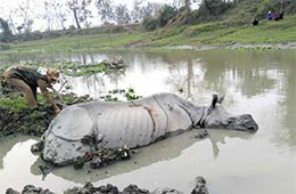 An adult female rhino which got stuck in a pool of muddy water since early this morning while attempting to take shelter near the bank of Difflo river in Borbeel area under Boloni camp area of Central range of Kaziranga National Park, died at around 12:30 pm yesterday (March 2). Earlier, efforts were made by Forest officials and the staff of Kaziranga National Park to lift the rhino out from the muddy water with the help of an excavator but they did not succeed. Forest guards were seen physically trying to help the rhino come out of the pool. There were some injury marks on the back of the rhino. Kaziranga DFO Rohini Ballav Saikia said that those marks might be due to internal injuries. When asked by this correspondent about the possible cause of the death, the DFO said that since the rhino was old, it could not overcome the stress that it had undergone. He also informed that there might be some internal injuries which can be figured out only after the post-mortem is carried out. One Response to "‘Old Lady’ stuck in mud-pool, dies!" If Indian citizens are not taken care of, then who will take care of these nonspeaking ones? For name sake department will show their faces after sickness or after death of other innocents.